Much of a hearing on confidentiality also serves as a forum for criticisms of the proposed $2 billion project. AUGUSTA — Opponents of a proposed east-west highway across Maine packed a legislative hearing Friday to lobby lawmakers for more access to information about the controversial project. They backed a bill that would strip the confidentiality provision from an existing law that governs access to information on major public-private partnerships involving theMaine Department of Transportation. But DOT officials said the bill would not apply to the east-west highway project. They also said that if the bill passes, it could discourage businesses from forming partnerships with the department because proprietary information might be disclosed, which would hamper economic development. Assistant House Majority Leader Jeff McCabe, D-Skowhegan, said his bill, L.D. 721, was motivated by constituent concerns surrounding the proposed $2 billion project, which would run from the Calais area on the New Brunswick border to the Coburn Gore area on the Quebec border. In written testimony, McCabe said the bill was not specifically about the east-west highway but was aimed at fostering more informed community discussion of major transportation projects. The bill would remove the DOT’s authority to restrict public access to records from transportation projects with an “initial capital cost” of $25 million or more, or when the project would establish tolls on roads that were previously toll-free. Records related to such public-private partnerships are now confidential until the DOT determines a project meets agency standards or until the proposal is finally rejected by the department. Bruce Van Note, deputy commissioner of the Maine DOT, said the east-west corridor proposal is currently a private project, outside the scope of the law allowing the department to participate in public-private partnerships. Furthermore, he said, there’s never been an application to the department for any public-private partnership. But after his testimony, Van Note acknowledged that the DOT has sent mixed messages on the project. In March 2012, DOT Commissioner David Bernhardt appeared at a New Brunswick forum with Peter Vigue, the Cianbro Corp. president and CEO who is the highway project’s main champion. The Bangor Daily News reported then that Bernhardt referenced the possibility of a public-private partnership. 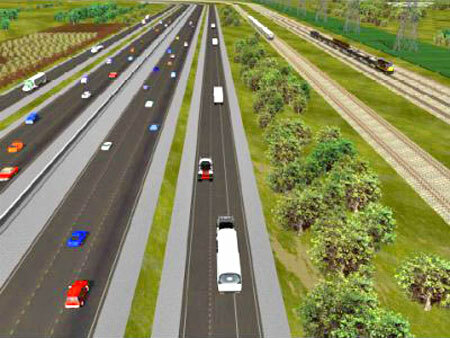 In April, DOT spokesman Ted Talbot said a feasibility study could include examining a variety of public-private partnerships that would make the highway project economically viable. Last year, the Legislature also directed the DOT to conduct a $300,000 economic feasibility study of the highway. Gov. Paul LePage, a project supporter, slowed the study last year after a Republican senator’s constituents raised concerns. Van Note said the DOT has spent “a few thousand dollars” to draft a request-for-proposal to conduct the study, which drew no response. When Rep. Wayne Parry, R-Arundel, said the state was acting “as an outside entity,” on what is now a private project, McCabe said he questioned whether it could work in that manner. “It is a branch of government and I think something we should push for as much transparency on as possible,” he said. Shenna Bellows, executive director of the American Civil Liberties Union of Maine, said confidentiality protections are too broad, and McCabe’s bill would benefit future public-private partnerships, even if there aren’t any now. But Van Note and Peter Mills, executive director of the Maine Turnpike Authority, said allowing public view of partnership documents in projects’ infancies would render the public-private program meaningless. Both added that they have never received public-private partnership applications, but they said companies considering large investments in Maine need protection from competition before the department acts on project details. Much of the public hearing, though, served as a referendum on the east-west highway project, with residents of communities near the corridor’s proposed route speaking not just to transparency, but to criticisms of the highway project. Charles Fitzgerald of Atkinson, a Piscataquis County town just east of Dover-Foxcroft, said he and many others are concerned because if the project is approved, it might not be just a road, but a 2,000-foot corridor that would cut through sensitive environmental areas. And Robert Morrison, of Charleston in western Penobscot County, said the scope of the project leaves the possibility open to an oil pipeline running alongside the highway. WASHINGTON — The Supreme Court on Wednesday ruled that logging companies and forestry officials in Oregon were not required to obtain permits from the Environmental Protection Agency for storm-water runoff from logging roads. The decision was a blow to conservationists who had used the permit process to block the silty runoff from logging, which they said choked forest streams. The ruling also suggested that at least some members of the court may be open to a fundamental re-examination of how federal courts approach determinations by administrative agencies. That is indeed settled law, but Justice Antonin Scalia, in a long and slashing dissent, said it was time to reconsider the idea that an agency may not only promulgate regulations but also say what they mean. In a concurrence, Chief Justice John G. Roberts Jr., joined by Justice Samuel A. Alito Jr., said the case decided Wednesday was not a proper one in which to reconsider a basic principle “going to the heart of administrative law.” But he added that Justice Scalia’s dissent amounted to an invitation for a new case squarely presenting the issue. Justice Kennedy acknowledged that discharges from logging roads are significant in rainy Oregon, contain “large amounts of sediment” and “can harm fish and other aquatic organisms.” But he said the agency was entitled to find that permits were not required under its regulations, though they were susceptible to more than one meaning. Justice Scalia wrote that the better reading of the regulations was to require permits. An exception for natural runoff does not apply, he said, when the water flows through ditches, culverts and the like. And, he added, another part of the regulations specifically lists logging as one of the covered industries. Just days before the case was argued in December, the agency issued a clearer interpretation saying no permits were required. State and federal officials urged the court to rule that the case was, as a consequence, moot. But all eight justices agreed that the logging companies remained subject to potential penalties under the old interpretation, keeping the case alive. 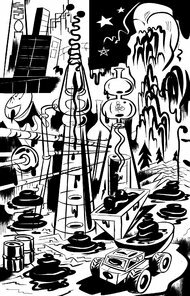 Justice Stephen G. Breyer did not participate in the two consolidated cases decided Wednesday, Decker v. Northwest Environmental Defense Center, No. 11-338, and Georgia-Pacific West v. Northwest Environmental Defense Center, No. 11-347. Judge Charles R. Breyer, the justice’s brother, had sat on the appeals court panel whose decision was under review. The downtowns of the rural towns along the routes were gutted of their local businesses and associated jobs. There were jobs created at the existing cities along the highways primarily in chain stores. The jobs created at retail chain stores came at the direct expense of the rural downtowns along the interstates. It was a job transfer away from the rural areas, with no net job gains for the state. No increased population growth came to areas along the interstates. The interstates did not halt the pre-existing out-migration trend in the rural areas. There was no significant Canadian investment outside of 100 miles of Montreal. The manufacturing industry in these states continued to decline. The MDOT concluded that an East West Highway through Maine would bring no “real economic benefit” and that the harmful “bypass effects” on the communities located on or near the route did not justify building a new four lane highway in Maine. SOURCE: 1999 A Summary of the Findings of Studies Regarding a Maine East-West Highway prepared by the Maine Department of Transportation. 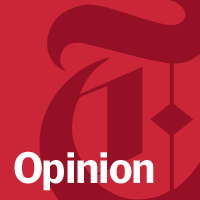 Road giants use semantics to whitewash lynchpin of very real economic and social merger. North America’s SuperCorridor Coalition (NASCO), often referred to as a principle player in the proposal for a “NAFTA superhighway”, has hit out at presidential candidate and Texas Congressman Ron Paul, branding him as “confused” and stating that it’s business “has nothing to do with any of his concerns” over the increasing move towards a North American Union. This superhighway would connect Mexico, the United States and Canada, cutting a wide swath through the middle of Texas and through Kansas City. One proposed path takes the superhighway right through Iowa. This superhighway can be built only by sacrificing family farms through eminent domain. Paul states the NAFTA superhighway will cut a wide swath through Iowa. For decades, I-35 has carried international trade with Canada, the United States and Mexico. Since the enactment of NAFTA, people have referred to the existing I-35 with the slogan “NAFTA superhighway” because it is a major north-south artery that moves a substantial amount of international trade. Recently, there have been rumors of a new NAFTA superhighway – a giant new highway being planned to link the three countries – and North America’s SuperCorridor Coalition Inc.’s promotional map has been used erroneously as proof that a blueprint of the proposed giant highway is, in fact, a reality. NASCO can state unequivocally that plans for a new giant NAFTA superhighway do not exist. Our map depicts existing transportation infrastructure not drawn to scale, but enlarged for promotional purposes. Paul is confused and has tied separate initiatives together into a sinister plot to destroy the sovereignty of the United States. NASCO has nothing to do with any of his concerns. NASCO is good for Iowa. There is no dispute over the existence of the NAFTA superhighway, NASCO admits that it already exists in the form of I35 and other connecting roads. 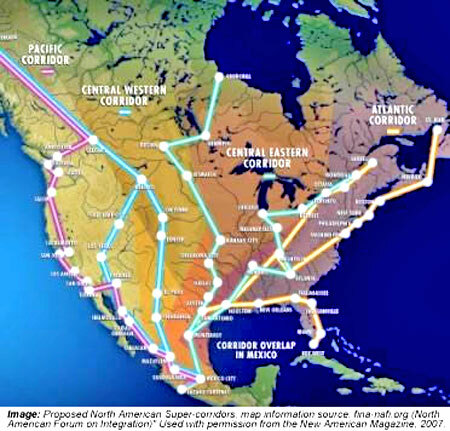 NASCO is claiming that the proposal to link Canada, the US and Mexico does not exist on the basis of semantics by insinuating that NAFTA trade corridors do not incorporate the building of a “new” superhighway by NASCO itself. Although this convoluted word play has constituted enough to deflect most mainstream hack journalists in recent months, it has not swayed those who have actually researched the North American Union agenda in its entirety, and that includes Ron Paul and other members of Congress and State Houses of Representatives. It has received $250 million in earmarks from the U.S. Department of Transportation to adapt existing roads as part of one NAFTA trade corridor. Reports indicate that proposals include a 10-lane limited-access road (five lanes in each direction) plus passenger and freight rail lines running alongside pipelines laid for oil and natural gas. 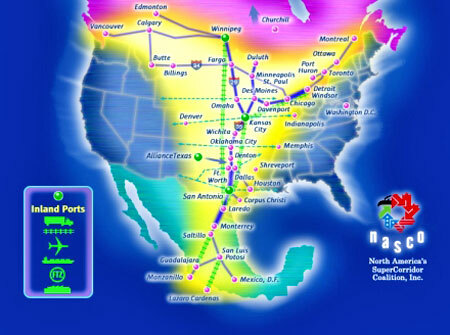 One glance at the map of the NAFTA Super Highway as produced by NASCO makes clear that the design is to connect Mexico, Canada, and the U.S. into one transportation system. Toll roads are to be placed upon existing roads in Security Prosperity Partnership agreements that bypasses Congress, agreements between the bureaucracies of the US and Mexican governments, to raise capital to build the Superhighway that will go South of Texas and into Mexico. Security Prosperity Partnership documents reveal that out of 85 interstate highways, 83 of them are slated to go under this agreement and toll roads are going down on them already. The money from this operation with further fund the dismantling of US sovereignty by seizing the infrastructure at it’s very heart in a bloodless coup. The highway is to be linked to the Trans-Texas Corridor the first leg of the highway which will connect Mexico with the US. This is being overseen by the Texas Department of Transportation (TxDOT) which is a member of NASCO. The Trans-Texas Corridor is a separate part of the physical infrastructure but is being built as part of overall plans to deepen the integration of Mexico, the United States, and Canada in a North American economic community that is a precursor to further union. 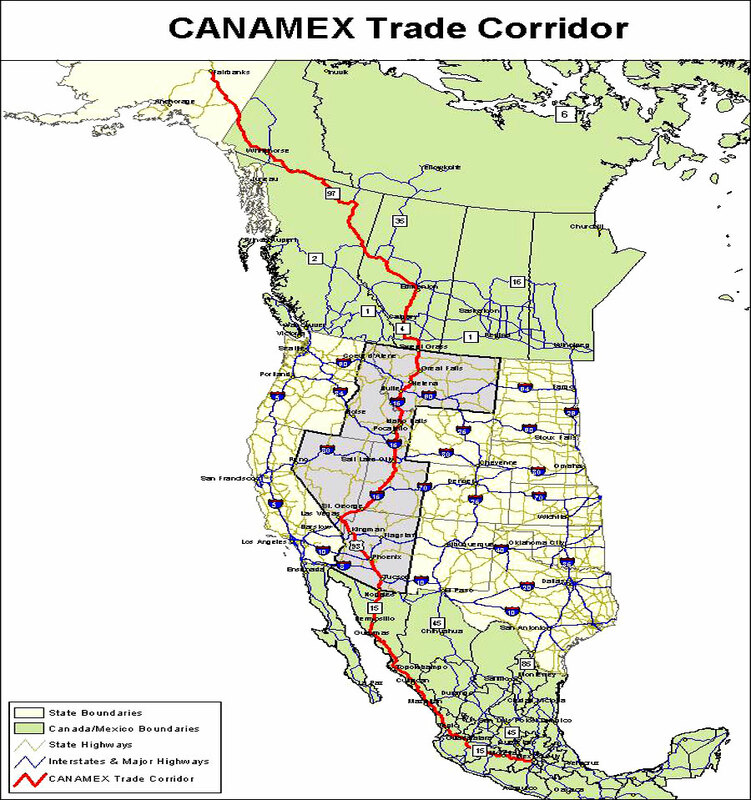 The NAFTA corridor movement also involves CANAMEX, another trade organization that promotes a Western tri-lateral route utilizing I-19, I-10, I-93 and I-15 in the states of Arizona, Nevada, Utah, Idaho and Montana to link the three countries in trade. See below (click to enlarge). 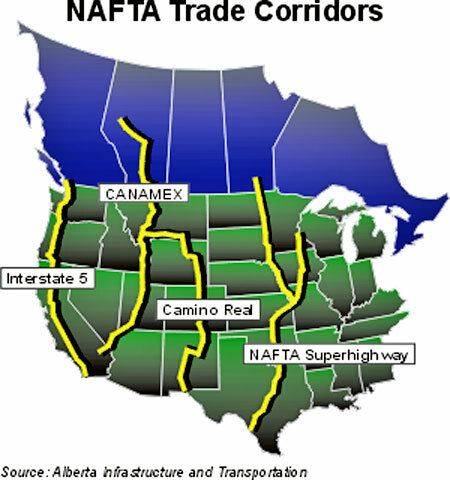 Another non-profit group, the North American Forum on Integration (NAFI), identifies four bands of NAFTA corridors (Pacific, West, East and Atlantic), all relying primarily upon internationalizing north-south existing interstate highways into NAFTA trade corridors. Read below. The government of the province of Alberta, Canada, highlights the four trade corridors on its own website, referring to NASCO’s arm as “the NAFTA superhighway”. The Province’s Infrastructure and Transportation division helpfully published online the map of the NAFTA Superhighway seen opposite. CANAMEX was one of the first north-south corridors designated as a High Priority Corridor under the National Highway Systems Designation Act. 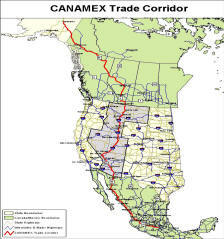 Actively pursued by Alberta since the early 1990’s, the CANAMEX Trade Corridor links Canada, the United States and Mexico and stretches 6,000 km from Alaska to Mexico, truly a pan-American corridor. Of course, as we have highlighted, such improvements and efforts to increase the flow of traffic requires immense funding (hence the tolls roads which come with their own threat to freedom of movement) and will incorporate enlargements to existing road networks. Enlargements that DO constitute the “building of a new” Superhighway and WILL threaten anyone who owns property wherever the enlargements need to be made. The architects of this North American unification are not just in name merging agencies, laws and regulations, they are physically getting rid of the borders by buying off and lobbying the politicians at the state level, who then hand the roads over to international bodies and their subsidiary companies. An article in MIT’s Technology Review magazine, for June 30, 2006, provides in-depth insight as to how the Spanish company Cintra has become a leading player in superhighway toll road projects in both Canada and the US. In 1999 Cintra, working in conjunction with Australia’s Macquarie Bank, won a 99-year contract to operate Toronto’s Highway 407 toll road, now already built and operating in 2007, which happens to run along Canada’s premier NAFTA trade corridor. Cintra is also contracted to operate toll roads in Indiana and on the Trans-Texas Corridor. At the end of January we reported on the revelation that one of Cintra’s conglomerate partners, the afore mentioned Macquarie, has agreed to buy dozens of newspapers in Texas and Oklahoma that have up until now been harsh critics of the Trans Texas Corridor superhighway. This indicates a clear example of influence peddling pointing to racketeering, and a desperate lunge to silence dissent against the sellout of American infrastructure and the North American Union. Since the Canada-US Free Trade Agreement was signed with the US, later expanded to become NAFTA, Canadians have reoriented their trade links away from a national focus (east-west) to a North American focus (north-south)…. As globalization proceeds, not as an offset to US-Canada trade or NAFTA enlargement and integration, but as a close complimentary advantage, Canada must adjust its thinking and design transportation strategies accordingly…. Again we see a call for “an adjustment of thinking” in accordance with NAFTA enlargement and integration. A second Canadian policy document was signed on July 30 this year by the governments of Canada, Ontario, and Quebec which announced a Memorandum of Understanding(MOU) on the development of the Ontario-Quebec Continental Gateway and Trade Corridor. Canada’s New Government has developed a National Policy Framework for Strategic Gateways and Corridors to advance the competitiveness of the Canadian economy in the rapidly changing field of global commerce…. Future federal gateway and corridor strategies will be guided by this framework, focused on transportation systems of road, rail, marine and air infrastructure of national significance to international commerce. The Ontario-Quebec Continental Gateway and Trade Corridor represents the North Eastern portion of the “NAFTA superhighway” depicted on NASCO’s map of existing road networks. The mainstream media will keep telling you none of this is real, that its on a par with invading space aliens and that if you believe in any of it you are totally crazy. And NASCO, who as we have shown are a major player, will keep using semantics to insinuate anyone who talks about it is “confused” or has “erroneously tied them into a sinister plot”. Of course, as with a great deal of the agenda for a North American Union, there is no all encompassing “sinister plot”, it operates very bureaucratically, yet without Congressional oversight, and is unfolding piecemeal for everyone to see. However, this does not mean it has not been carefully planned is not a threat to the Sovereignty of America, Canada and Mexico. The agenda is being driven by elitist private interests operating in cooperation with the globalist think tanks and lobbyists who have usurped the overriding interests and responsibilities of our governments for their own corporate gain and the power that brings to them. They consequently have no duty to the prosperity of the countries involved and the people who populate them, despite being intimately involved in the fundamental operation of the infrastructure. For NASCO to therefore declare that their business “has nothing to do with any of his concerns” when referring to Ron Paul‘s exposure of such activity represents the height of arrogance and insults the intelligence of any free thinking person living in America, Canada and Mexico.